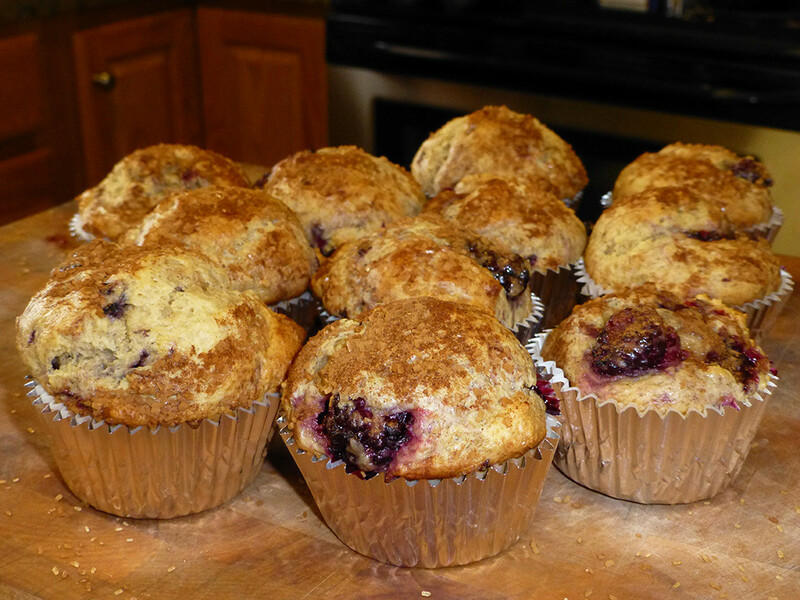 Cinnamon-blackberry muffins to share with friends today. The recipe is from the King Arthur Flour Baker’s Companion. The variation I baked featured a teaspoon of cinnamon and three cups of blackberries added to the muffin mix, and I sprinkled the tops with a mixture of turbinado sugar and cinnamon before they went in the oven. They already have butter and sour cream in them, but are further improved when hot by a small pat of butter. “What isn’t?” I just said to myself. This all-purpose, basic muffin does very well with any number of garnishes (see suggestions below). The batter will keep, once mixed, for up to one week in the refrigerator. It’s nice to wake up, turn on the oven, make your morning coffe, scoop two muffins, pop them in to bake and by the time you’ve fetched the paper and let the dog back in, you’re ready to settle down for a wonderful, warm, fresh-baked treat. Preheat oven to 400F/200C and lightly grease muffin cups or use paper liners. In a medium-sized bowl, whisk together the flour, baking powder, baking soda, and salt, then set aside. In a large mixing bowl, cream the butter and sugar together with a handheld or stand mixer until light and fluffy and almost white in color. Scrape down the bowl to make sure all the butter is incorporated, add the eggs, one at a time, beating well after each addition. Add the vanilla and sour cream and mix until incorporated. Apple Cinnamon: Peel and grate 3 to 4 tart apples, such as Granny Smith or Jonathon. Fold into muffin batter with ¼ cup cinnamon sugar (¼ cup sugar, 1 tsp cinnamon). Top muffins with more cinnamon sugar before baking, if desired. Apricot, cherry, cranberry, date, raisin: Soak 2 cups of any of these dried fruits in 1/3 cup orange juice, water, rum or bourbon, then fold into the muffin batter. Garnish muffin tops with chopped nuts if desired. Apple, banana, nectarine, peach, plum: Dice 3 cups of any of these fruits and fold into batter before baking. Garnish muffin tops with granulated sugar. Blueberry, raspberry, blackberry: Fold 3 cups berries into batter before baking; sprinkle the tops with cinnamon sugar or streusel before baking. Carrot-Ginger-Raisin: Add 2 cups shredded carrots, 1/2 cup crystallized or minced fresh ginger, and 1-1/2 cups raisins to batter before baking. Cherry Chocolate Chip: Add 1-¼ cups dried sweet cherries (soaked in ¾ cup liquid for 20 minutes if they’re very hard) and 1-1/4 cups chocolate chips to batter before baking. Peanut butter chocolate chip: Add 1-½ cups creamy peanut butter (it helps to soften the peanut butter in the microwave before combining it with the batter) and 1-½ cups chocolate chips to batter before baking. Toffee Chocolate Chip: Add a 10-ounce bag of Heath bar bits or 1½ cups of your favorite buttercrunch and 1½ cups chocolate chips to batter before baking. Apricot almond: Add ½ tsp. almond extract, 1-½ cups diced apricots, and 1 cup sliced almonds to batter before baking. Banana Coconut: Add 2 diced bananas and 1-½ cups shredded sweetened coconut to batter before baking. Date Nut: Add 1-½ cups each dates and pecans to batter before baking. Maple Walnut: Add ½ cup maple sugar and 1-½ to 2 cups chopped walnuts to batter before baking. Waldorf: Add 2 tart apples, grated and peeled, ½ cup chopped dates and ½ cup chopped walnuts to batter before baking. This entry was posted in Baking and tagged blackberry, cinnamon, muffins. You make it so hard for me to stick to my bread-free diet (which is working! I’m losing weight again after stalling for the last 3 years) with photos of such loveliness. Those look absolutely scrumptious. I’ll warn you now not to read the updated post, then. Too late? On the other hand, if you’d need any assistance with rationalising, technically speaking, these aren’t bread at all, but cake-like muffins. Plus, think of all the calories saved because I didn’t include the recipe for blackberry butter cream frosting. This time. Yeah I agree foodandart, he can be cruel sometimes. Or just insensitive to us hungry folks that shouldn’t be thinking about bread and cakes. Eh lalo? Improving our Saturday indeed! Saturday’s are turning into a minefield here at Finley’s! I’m scared to look in! Criminey, minefield? Take that out of context and one might get the idea that I’m posting highly unpleasant things. I suppose I could, for balance, post a photograph of a single pale wafer-thin water cracker. With nothing on it. On a backdrop of a plain white sheet of paper. Bearing no text. Maybe a combination of things you see in nature, you do that very well, and cooking projects ? I dont know just an idea lalo.